Britain's wheat harvest this year could be almost 30% smaller than it was last year because of extreme weather, the National Farmers' Union has warned. In a snapshot poll, it found a smaller area was planted last autumn because of the wet soil conditions. 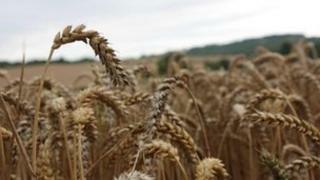 However, the NFU said there was no reason to suggest a lower quality crop. The National Association of British and Irish Millers said a lower yield would not affect prices, which are governed by bigger global producers. The NFU questioned 76 farmers covering 16,000 hectares (40,000 acres) of land and its findings suggested wheat production would be below average for the second year in a row. NFU combinable crops chairman Andrew Watts said the continually wet weather during planting time, between September and December, had resulted in less wheat being planted. He also said subsequent bad weather, including flooding and snowfalls, had not been conducive to a high yield. Most of the UK's wheat crop is harvested between July and September and last year's harvest had lower volumes and quality because of weather extremes, with months of drought followed by downpours and flooding. Earlier this year, breakfast cereal producer Weetabix said it would have to temporarily scale back production of some of its products because of the poor wheat harvest. Alex Waugh, from the National Association of British and Irish Millers, said the lower-than-normal crop yield was not good news for farmers but it was unlikely on its own to make a difference to consumers in the UK. "What happens in the UK depends on what is going on internationally," he said. "And although it is still early days because the harvest is still a few months away, the expectation around the world is for a good crop. Grain prices might actually turn out slightly lower than they are today." "Grain prices in the UK are only likely to rise if they are also rising elsewhere in the world." Mr Watts said: "A myriad of factors have hit arable farms this year, from the extreme weather through to news that there will be restrictions on neonicotinoids (neuro-active insecticides) to come in the future. "Our poll is a snapshot, but it is extremely worrying that the planted area remaining viable for 2013 harvest on those farms looks set to be 29% smaller than last year. If this plays out nationally, we will be below average production for the second year in a row. "The saving grace in past years has been crop protection technology which can help maintain yield potential and all-important grain quality by guarding against pests and ensure crops are more drought and flood resistant." However, he said lobbying had led to potential restrictions on the use of certain pesticides amid concerns about their impact on bees and fungicides. In a separate survey, the NFU found nearly half of arable farmers (45%) felt less confident about the prospects for their farm businesses in the next 12 months compared with 2012. It was "hardly surprising" that short-term confidence was so low under those circumstances, Mr Watts added. "If the experts are to be believed and extreme weather is to become more frequent over the coming years, we must look at ways of supporting the industry," he said. The NFU urged the government to support farmers by ensuring pesticides - which protect crops - continued to be used to safeguard future harvests. It also called for ministers to keep reforming the system which pays farming subsidies, to ensure its members were not at a disadvantage compared with other EU farmers.